Taíno (good people), were seafaring indigenous peoples of the Bahamas, Greater Antilles, and the northern Lesser Antilles. They were one of the Arawak peoples of South America, and the Taíno language was a member of the Arawakan language family of northern South America. At the time of Columbus' arrival in 1492, there were five Taíno chiefdoms and territories on Hispaniola (modern-day Dominican Republic and Haiti), each led by a principal Cacique (chieftain), to whom tribute was paid. Ayiti ("land of high mountains") was the indigenous Taíno name for the entire island of Hispaniola, which has kept its name as it is used as the Haitian Creole form for Haiti. Cuba, the largest island on the Antilles, was originally divided into 29 chiefdoms. Most of the native settlements later became the site of Spanish colonial cities retaining the original Taíno names, for instance; Havana, Batabanó, Camagüey, Baracoa and Bayamo. The name Cuba comes from the Taíno language; however the exact meaning of the name is unclear but it may be translated either as "where fertile land is abundant" (cubao), or "great place" (coabana). Puerto Rico also was divided into chiefdoms. As the hereditary head chief of Taíno tribes, the cacique was paid significant tribute. 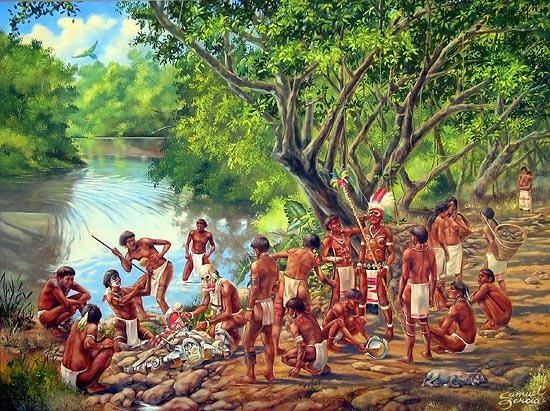 At the time of the Spanish conquest, the largest Taíno population centers may have contained over 3,000 people each. The Taíno were historically enemies of the neighboring Carib tribes, another group with origins in South America, who lived principally in the Lesser Antilles. The relationship between the two groups has been the subject of much study. For much of the 15th century, the Taíno tribe was being driven to the northeast in the Caribbean (out of what is now South America) because of raids by the Carib. Women were taken as captives, resulting in many Carib women speaking Taíno. The Spaniards, who first arrived in the Bahamas, Cuba, and Hispaniola in 1492, and later in Puerto Rico, did not bring women in the first expeditions. They took Taíno women for their common-law wives, resulting in mestizo children. Sexual violence in Haiti with the Taíno women by the Spanish was also common. Scholars suggest there was substantial mestizaje (racial and cultural mixing) in Cuba, as well, and several Indian pueblos that survived into the 19th century. The Taíno became extinct as a culture following settlement by Spanish colonists, primarily due to infectious diseases to which they had no immunity. The first recorded smallpox outbreak in Hispaniola occurred in December 1518 or January 1519. The 1518 smallpox epidemic killed 90% of the natives who had not already perished. Warfare and harsh enslavement by the colonists had also caused many deaths. By 1548, the native population had declined to fewer than 500.